Take Front Street west from Downtown area, past Division Street. Continue until road begins to turn left/south. Look for our blue and bright green sign on your left at 3537 West Front Street. South: Take US-31/Division to Front Street. Turn left. Continue until road begins to turn left/south. Look for our blue and bright green sign on your left. 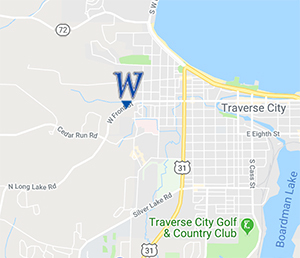 West: Take Long Lake Road toward Traverse City. At the bottom of Cedar Hill, look for our blue and bright green sign on the right.